Many surprises when I started exploring pattern blocks earlier in the year. One was that many methods of drafting patterns to individual measurements assign half your bust/ waist/ hip measure to front and half to back. Surely not, I thought. And indeed it isn’t true for me. Knowles. 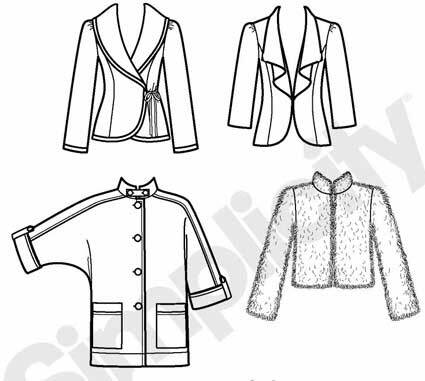 Pattern making for fashion designers : juniors, misses, and women. Liechty, Rasband, Pottberg-Steineckert. Fitting and pattern alteration (hurrah, my birthday present this year). – horizontal velcro tapes at waist, high hip, hip. – vertical tapes at CF, side seam, and CB. – looked from the front as if they were at the edge of my body. – looked from the side as if they roughy divided the area of the body in half. No photos – I haven’t got a leotard, so it was all rather untidy ! I don’t attempt to measure to an accuracy of 1/16 inch or 1 mm, as BML tells you to. Impossible accuracy with a soft flexible body. It’s easy to change the measure much more by a slight change in tension of the tape measure or posture of the person being measured. I know 1/8 inch can make a difference to the quality of fit. But that’s in fabric being tried on. I aim for measures to the nearest 1/4 inch/ 0.5 cm. Details to be adjusted on the ‘muslin’. My total waist measure is 33-1/2 in., total hip 43-1/2 in. Both Big4 pattern size 18. Apparently no problem there then. Interesting, I still have a waist at the back, but there’s all that stomach sticking out in front. Yes, it does go in and out daily. – darts below waist need to be short, and mainly at the back. – below high hip there’s little change. My high hips are about 3-4 inches below my waist. But as I have a tilted waist (higher at back due to high hip pads), a level high hip is not the same distance below my natural waist all the way round. I’ve still got an indented waist in silhouette from the front, but have difficulty fitting it. Easiest with a waist seam, which isn’t usual in a blouse. I’m sure it is possible to get princess seams to fit me well at the back, but I haven’t got round to it. 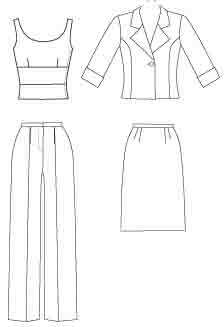 Here’s my personal waist-to-hip pattern which shows the different front (right) and back shapes. These measures helped me understand much, but they don’t give the complete picture. My front waist and hip measures may be similar, but I’m not the same shape all the way down – forward spreading waist becomes hips spreading sideways. Visually, my widest hip is lower in my silhouette from the front than it is in my silhouette from the side. And unlike my stomach, that large back is just generally large, not protruding. Don’t even try to imagine what I look like in a RTW fitted jacket ! Some people need front bigger than back below the waist. Sandra Betzina ‘No Time to Sew’ p.15 says she cuts a size 14 pants front and size 10 back. Above the waist, I have small bust and wide back. Many people have larger upper front than back. FBAs need to be adjusted for personal shape and ease preference. See my post on the FBA for some comments. Here are some other features of my body, as described by Liechty et al. Short lower rib cage/ high waist. similar to sloping shoulders but I think this is more ‘me’. Scoop out armholes sideways. I haven’t got large biceps but do need a large armhole. I’ve learned to check cut-on sleeves to make sure they’re not tight. Don’t know if my bones are large, but I do like to be comfortable when I bend my arms. – I’ve recently realised my forward head has made my neck go visually from long to short. – lumpy knees and thick ankles. No I don’t look like a freak. But RTW doesn’t look good ! And, with so many non-average features, no wonder I find it easier to get good fit by starting from my personal pattern block and adding style elements to it. Rather than starting from a commercial pattern and making all these changes. I don’t think all this self awareness gets you out of making a trial garment. Even when you’ve gone through the pattern-muslin-pattern-muslin cycle several times and have a good fit, it’s best to check that length, ease, and style elements such as collar shape, pocket placement, etc. are flattering. Also best fitting method depends on personal preference. I don’t at all enjoy tissue fitting. I prefer working direct with a muslin, ‘reading the wrinkles’. Rather than trying to get all the adjustments done accurately to the pattern before ever trying something on. I’d like to to encourage people who have unusual fitting challenges. Of course it’s marvellous if you find commercial patterns which are close to your body shape, or a fitting aid which works for you. But there are people who have too many features away from average for that to be possible. And many of those special features aren’t dealt with in the pattern making books which claim to tell you how to draft a personalised pattern. I’m not so analytic about all this when I do the actual fitting. I fit by ‘reading the wrinkles’ on a muslin. I make no attempt to resolve all my fitting issues one by one on the pattern before cutting out. Though there are many fitting issues which need a rough change to the pattern before cutting the fabric, or there won’t be enough fabric available to make the detailed adjustments. (Though if you make a muslin, you can slash and spread on the body to add the wedges of fabric needed.) Such as a long body, or square shoulders, or a large bust cup, or protruding front and rear when fitting pants. Or different sizes front and back, above and below. And I am the sort of person who likes to understand what I’m doing. For example, I need a personalised armhole to be comfortable. Liechty et al is the only book I know which explains what it is about my body which makes this necessary, and what to do about it. October 2016. Amy Hertzog’s on-line tutorials are no longer available. She now has a book, Knit to Flatter, and a Craftsy class, also Knit to Flatter. She gives much detail about hand knitting, but the general ideas apply to all garments. 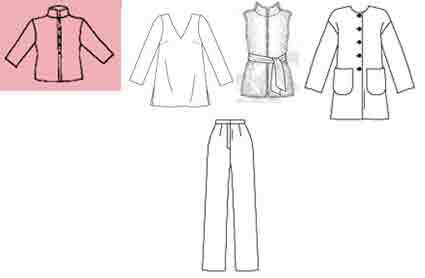 This post has some comments on applying the ideas to dressmaking patterns. Amy Herzog’s tutorials are a marvellous series about the style elements that flatter and don’t flatter different body shapes. And how to make fit changes. – We can’t try something on until it’s partly finished. So how do we know beforehand that we aren’t wasting our time, effort, money, and beautiful materials on making something that looks marvellous on the model and dreadful on us ? – Most of us have body features that are not ‘average’. How can we alter an ‘average’ pattern so it fits us better ? This is actually easier for dressmakers – we just have to alter the paper pattern. We don’t have to calculate the details of stitches and rows. In this series there are excellent photos of real people wearing right and wrong shapes (generous of them to show that). Especially tops and casual jackets. The examples are hand knits, but the advice about styling and shaping applies to any clothing, made or bought. So read “dressmaker” instead of ‘knitter’ and “top” instead of ’sweater’. Types of body shape and suggestions about what flatters them. Starting from body shape and showing what styles do and don’t look good. Also starting from patterns and suggesting body shapes they look good on. Use photos to identify your body shape. Some comments on easier and more difficult pattern changes. Advice on necklines that flatter different body shapes. Instructions for changing width and depth of neckline in knitting patterns. 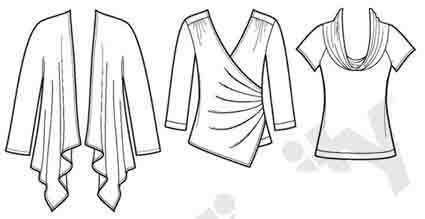 For suggestions about changing necklines in dressmaking patterns, see my necklines post. Flattering length, width, and shape of sleeves. Again the instructions section is about knitting. 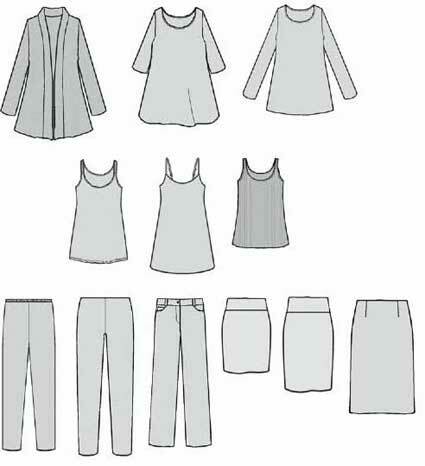 For dressmaking patterns, it’s usually easy to change sleeve length. To change sleeve width or shape which involves changing the armhole, it’s easiest to substitute the sleeve from another pattern. Match up the centre lines and shoulder seams of the 2 patterns and trace the armhole across. If you use the correct armhole for it, you won’t need to change the new sleeve. If you want a wider sleeve without changing the armhole, most fit books tell you how to alter sleeve biceps width without altering the sleeve cap length. Or simply use a larger size sleeve from the same pattern, with the armhole to match. 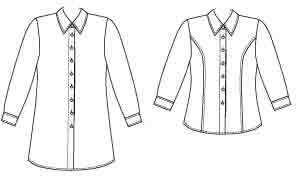 Brensan Studios Shirt Club are patterns you can swop sleeve styles between as they have the same armhole. Where best to put the horizontal lines on your body. When she says to use ’short rows’ if you have a tummy, she means add a downward curve to the centre front hem. 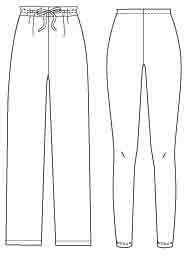 The section on pattern modifications uses measurements of the lengths of your body sections (taken in Section 4). So it applies to dressmakers as well as knitters. Guidance about where you need shaping darts. For me it’s important to know about my high hips (circumference, and distance below waist) as well. Where you need darts, and how large to make them. Advice that’s the same for dressmakers. Good on shaping for the back – I recognise myself here. When she tells a knitter to use short rows, it’s a way of adding length at the centre of a garment piece without changing the length of the side seams. Dressmakers achieve the same result by adding horizontal darts from the side seams. 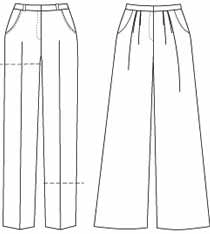 Do you know how to add darts to a dressmaking pattern? It’s often easier than in knitting. Perhaps easiest to learn by experimenting with a trial garment to find what works for you. Making your custom styled top pattern. 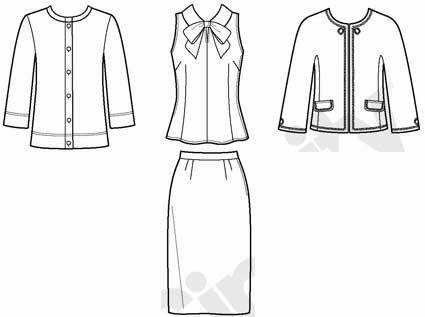 Choosing the best style elements for you from all the previous sections : this is the same process whatever the source of your clothes – knitting, sewing, RTW. The measurements section is also relevant to dressmakers. Though do add bigger ease levels if your pattern is for woven rather than knit fabrics. There’s a section for knitters on doing the pattern calculations. This is the only section in the whole series where there’s not much for dressmakers. – develop well fitting personal basic pattern blocks, or learn what changes you need to make to commercial patterns. – learn how to transfer style elements from one pattern onto another. Review, plus ideas on how to use favourite style elements from any pattern in a way that’s best for you. All the recent wardrobe planning reminded me how much I like sweater knits. But the simplest sweater patterns are basic rectangles, which are not good on my pear shape. So this Fit to Flatter series is just what I need. It is very relevant to choosing flattering style elements for anyone. 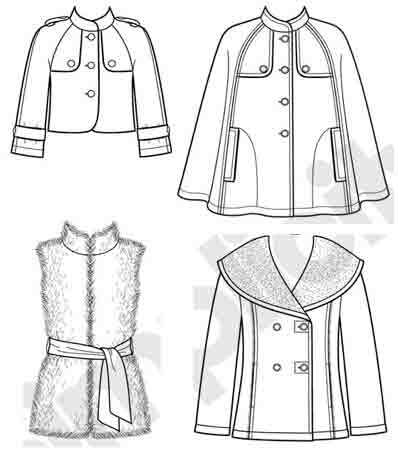 And for making appropriate pattern alterations in dressmaking as well.